Ford plans to renovate the abandoned Michigan Central Station into new campus in Detroit's Corktown neighborhood. LANSING, Mich - Vital support for the Ford innovation hub in Detroit's Corktown neighborhood, along with three other automotive and technology-related business expansions, a new commerce center in Hazel Park, and community revitalization projects including a significant improvement to downtown Battle Creek, was approved by the Michigan Strategic Fund board today. Overall, the MSF board approved projects expected to generate more than $1 billion in private investment and create 4,574 direct jobs, the Michigan Economic Development Corporation announced. "Today's high-impacts projects – from Ford's transformational development in downtown Detroit, to continued investment in automotive high-tech, to revitalization of our communities like Battle Creek – demonstrate that Michigan's momentum continues and offers the promise of even greater economic growth," said Gov. Rick Snyder. "I applaud and am thankful for this tremendous investment in Michigan's future by our business community." 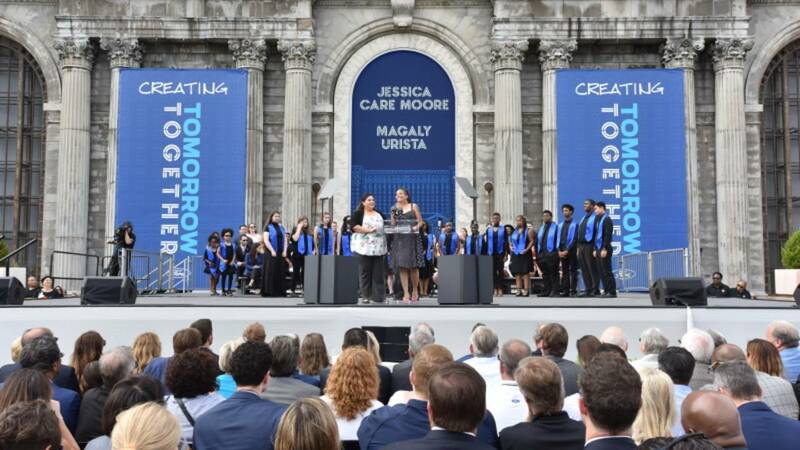 Ford Motor Company plans to transform the historic, long-vacant Michigan Central Station and several adjacent properties into a vibrant new campus in Detroit's Corktown neighborhood that will be an innovation hub for Ford's vision for the future of transportation. The state-of-the-art facility will be where Ford and its partners develop autonomous and electric vehicles, and designs mobility services and solutions for urban environments. The station will be restored to its original grandeur and serve as the centerpiece of the campus as well as a mixed-use space for the community to gather and enjoy. The project is expected to generate a total private investment of $740 million and bring 2,500 jobs directly with Ford, and an additional 2,500 jobs with Ford's partners and suppliers. In September, Ford committed $10 million for programs to support economic growth, housing affordability, workforce development, parks preservation, neighborhood safety and preserving Corktown's culture. The Michigan Strategic Fund today approved a 30-year MSF Designated Renaissance Zone valued at approximately $208.8 million in support of the project. "We are grateful for the decision by the Michigan Strategic Fund Board to approve he Renaissance Zone for Ford's Corktown campus," said Ford Motor Company Vice President of Government Relations Curt Magleby. "With the support an partnership of the State of Michigan, the City of Detroit and Corktown residents, we can now proceed with this exciting and transformative project that will help Detroit remain at the forefront of mobility." The city of Detroit has also approved Commercial Rehabilitation Act and Obsolete Property Rehabilitation Act tax abatements in support of the project. The estimated value of the abatements is $27 million in net fiscal benefit to the city of Detroit and other taxing jurisdiction. "The DEGC is focused on transformative projects that drive the opportunity in our neighborhoods," said Kevin Johnson, DEGC president and CEO. "We view incentives as mutually beneficial partnerships that bring jobs to Detroit. Working together with private industry and our regional developments colleagues, the DEGC will attract businesses that continue Detroit's positive economic momentum." Aptiv US Services General Partnerships is a global technology company that develop safer, greener and more connected solutions enabling the future of mobility. Aptiv has approximately 150,000 employees and operates 14 technical centers, as well as manufacturing sites and customers support centers in 45 countries. Aptiv plans to renovate its existing facility in the city of Troy to seat approximately 500 engineers and support staff. Aptiv conducted a national search and narrowed its finalists to four states earlier this year. After a competitive process Michigan came out on top, beating states in three different time zones. Aptiv is expected to generate a total private investment of $20 million and create 500 jobs over the course of the project, resulting in a 100-percent Good Jobs for Michigan tax capture for up to 10 years valued at $30.6 million. Governor Snyder signed the Good Jobs for Michigan bills into law last July. The intention of the jobs-initiative package is to attract projects that result in a significant number of high-paying jobs with employees making more than the target regional wage. Good Jobs for Michigan allows the state to compete globally at a higher scale for transformational projects while also helping to further diversify the state's economy. "Governor Snyder met with Aptiv executives last year and made the case that there is no better place in North America for high-tech companies to expand and succeed than Michigan," said Jeff Mason, CEO of MDEC, the state's chief marketing and business attraction arm that administering programs and preforms due diligence on behalf of the MSF. "Aptiv's investments is a catalyst for attracting other technology companies and underscores the strength of the state's high-tech automotive assets." "The Detroit Regional Chamber is proud to have supported the MDEC in securing this tremendous win for the region. Aptiv choosing to invest here is a testament to our ecosystem's continued strength as a global center for leading mobility companies," said Justin Robinson, vice president of Business Attraction for the Detroit Regional Chamber. "The City of Troy is thrilled that Aptiv plans to locate its mobility research and development facility at its current Troy location. Aptiv is a global leader in developing advanced future mobility solutions," said Troy Mayor Dane Slater. "Aptiv's decision to locate its mobility R&D facility in Troy expands upon Troy's reputation as a global hub for cutting edge research, development, engineering and technology." Samsung SDI Co., Ltd., manufactures rechargeable batteries for the IT industry, auto industry and energy storage systems, as well as cutting-edge materials used to produce semiconductors, displays, and solar panels and employs more than 20,000 people worldwide. Its US subsidiary, Samsung SDI America, Inc., headquartered in San Jose, California, currently has 130 Michigan employees and plans to expand its manufacturing presence by creating its first high volume automotive battery pack manufacturing facility in the United States in the city of Auburn Hills. The facility will be SDI's principal North American electric vehicle battery pack manufacturing location. The project is expected to generate a total capital investment more than $60 million and create more than 400 jobs, resulting in a $10 million Michigan Business Developments Program performance-based grant. Michigan was chosen over strong domestic and international competition. "We're excited Samsung SDI America has expanded its footprint in Oakland County Executive L. Brooks Patterson said. "The company, with investment of more than $62 million and the creation of 461 highly skilled positions, clearly demonstrated its faith in our educated workforce and our country. It's a strong vote of confidence." "We are honored that Samsung SDI America, Inc. has chosen to continue its growth in Auburn Hills. This new investment and creation of jobs will allow Samsung SDI, Inc. to continue developing technologies in automotive battery back manufacturing. We appreciate their their confidence nad reinvestment in our community," said Auburn Hills Mayor Kevin McDaniel. "Our city council and staff have worked diligently to support this exciting project and we are looking forward to their continued success. On behalf of the city council, city staff and our more than 2,300 residents, we thank Samsung SDI America, Inc."
The city of Hazel Park Brownfield Redevelopment Authority received approval of $21,436,910 in local and school tax capture to support and business development project that will involve the new construction of two speculative commercial buildings on a portion of the former Hazel Park Raceway site. The Tri-County Commerce Center (TCCC) Redevelopment Project will consist of constructing TCCC Building #2, a 650,000-square-foot building and TCCC Building #3, and 804,000-square-foot building. The new building will be constructed as modern, flexible space, high-bay, multi-tenant, move-in ready facilities for manufacturing, warehouse and distribution uses. The project is expected to generate a total capital investment of $85 million and create 613 full-time equivalent jobs, and will bring an inventory of high-quality, readily available space for manufacturing companies looking to invest or grow in Michigan. The tax capture will be used to alleviate brownfield conditions at the site, making it suitable for redevelopment. Spartan Michigan, LLC, a joint venture between Glanbia plc, Dairy Farmers of America, Inc. and Select Milk Producers, Inc., plans to construct a 142-acre dairy processing facility inf the city of St. Johns. The facility is expected to process more than 8-million pounds of milk per day and manufacture cheese and whey protein powder. When completed, the Mid-Michigan site will be among the largest dairy processing facilities in the country. The project is expected to generate a total investment of $425 million and create up 259 jobs. The MSF today approved a $2 million Michigan Business Development Program performance-based grant in support of the project. "We are excited to be underway with developing a new dairy plan in St. Johns," said Glanbia Nutritionals Senior Vice President of Group Sustainability & US Corporate Affairs John Dardis. "The continued support of MEDC, as well as the state and city authorities, has been a central component of our investigation in Michigan." UP Paper, established in 1920 in Manistique, manufactures recycled Kraft paper products sourced from recycled paper products. The company currently employs 97 people and one of the larger manufacturing employers in the area. The company's plant is at full capacity and plans to add four new full-time employees in the next six months and an additional four within the next two years. MSF is providing approximately $1.9 million in collateral support that will support its working capital line of credit from Crestmark, a division of Meta bank. Heritage Tower BC LLC plans to rehabilitate a long-vacant, historic building into an iconic and active mixed-use development in downtown Battle Creek. The completed project will consist of market-rate apartments and commercial, retail, office space. The 19-story building is the tallest building in Battle Creek. The project is expected to generate a total capital investment of $32.3 million and create 15 full-time equivalent jobs and will bring new residents and commercial business to the central core of the city, while acting as a catalyst for other investment inf the downtown area. As a result, the project has been awarded a $10 million Michigan Community Revitalization Program other economic assistance loan and equity investment. In addition, the City of Battle Creek Brownfield Redevelopment Authority received MSF approval of $2.426,600 in local and school tax capture to be used to alleviate brownfield conditions at the site. Through a Program Related Investment by the W.K. Kellogg Foundation, the city of Battle Creek is contributing a $5 million investment in support of the project, and has approved Obsolete Property valued at $3.1 million. Other local support includes a $3.1 million investment from Battle Creek Unlimited and $450,000 contribution from the Battle Creek Community Foundation. The City of Kalamazoo Brownfield Redevelopment Authority received MSF approval of $3,844,493 in local and school tax capture to support the Catalyst 12 project in downtown Kalamazoo. The project includes the redevelopment of an existing surface parking lot into a seven-story mixed use building that, when completed, will include office space and 49 market-rate and affordable residential units. The project is expected to generate a total capital investment of $70.8 million and create 50 full-time equivalent jobs, and will bring increased density and vibrancy as well as much-needed residential and commercial space to the downtown. The tax capture will be used to alleviate brownfield conditions across the site, making it suitable for redevelopment. The Michigan Strategic Fund also approved a $2,125,000 MSF grant for the Michigan Manufacturing Technology Center to continue to provide support services to Michigan's manufacturing industry including assistance in support of the Pure Michigan Business connect program. "Leading businesses continue to realize the competitive advantages that Michigan has to offer; high-tech engineering resources, top-notch research and design, and a highly-skilled workforce matched with a low cost of living and low cost of doing business," Mason said. "With announcements like KLA-Tencor last month and Samsung today, we continue to see increased interest in Silicon Valley companies looking to relocate or expand into Michigan. The jobs, both direct and indirect, created by Samsung, Aptiv, Ford and others will further expand Michigan's high-tech, R&D and engineering footprint today and position us for future growth."